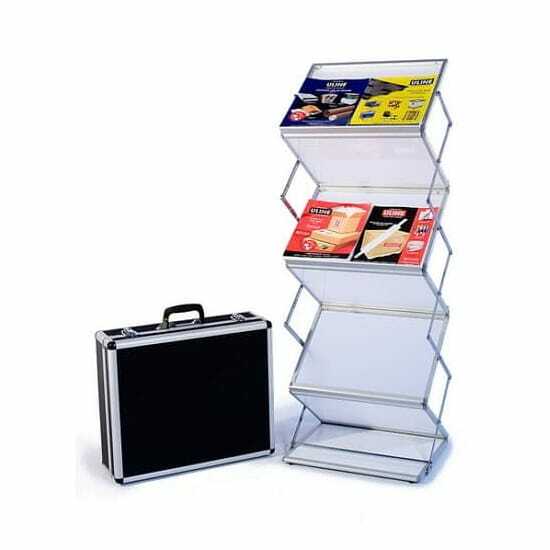 Our Amazing Collection of BEST SELLERS and innovative Portable DISPLAYS READY TO GO. Perhaps on a time crunch? 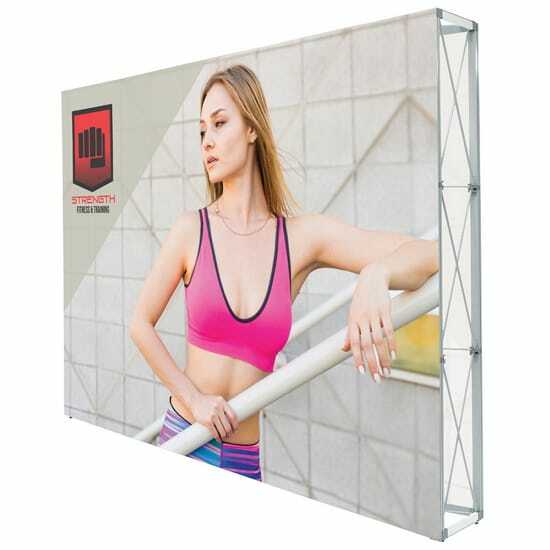 Our Portable Displays To Go are Fast, Cost-effective, and Reliable solutions delivered in as little as 24 hours from facilities in California or Pennsylvania. Can I get my displays to go order tomorrow? Yes if there is no printing involved. 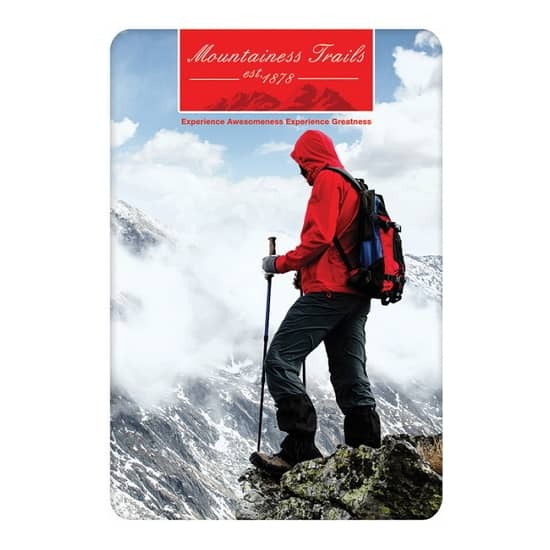 Place your on-line order by 1:00 pm EST, make sure to indicate the correct shipping method: UPS Ground may be 1-day transit but it is not guaranteed. OK but I need custom printing? 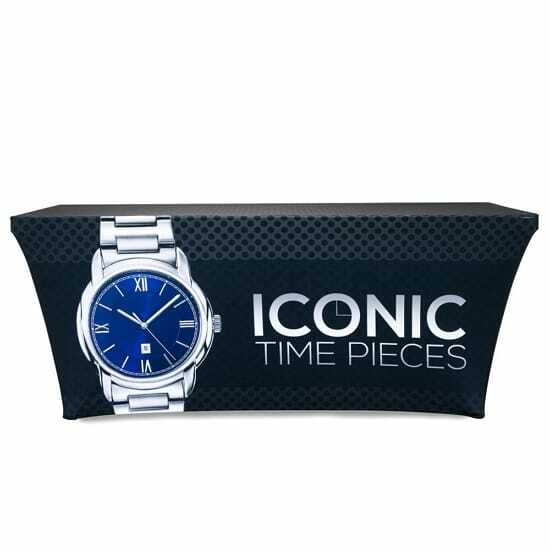 Most graphic turnaround times need two (2) days of production which begins the DAY AFTER you approved the e-proof. Large quantities are subject to longer turnaround times. You don’t understand I needed it yesterday? Yes, sounds familiar. We have helped many customers who needed it yesterday as we offer RUSH service whenever possible. 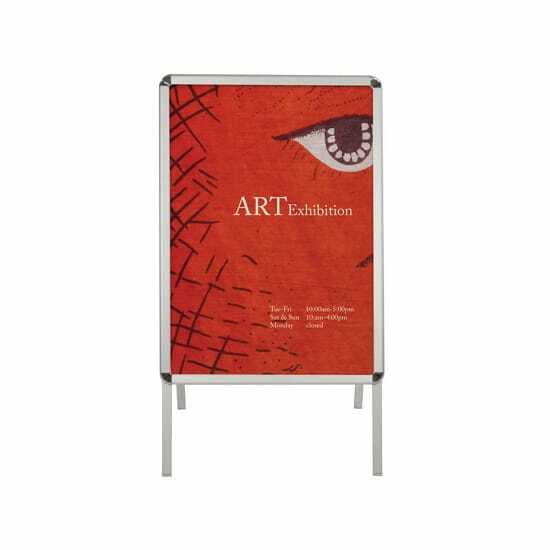 Simply call us right away and have your display artwork ready on template as well all required billing and shipping details. We will do everything we can to help you. Example: to get a Displays To Go order delivered this Thursday, I must place my order with artwork on Monday by 10:00 am EST. By 4:00 pm EST, I will receive an e-proof which I need to approve by 5:00 pm. Production starts on Tuesday (day after) and my order is ready to ship on Wednesday (if a 2-day production) or Tuesday (if Rush available). 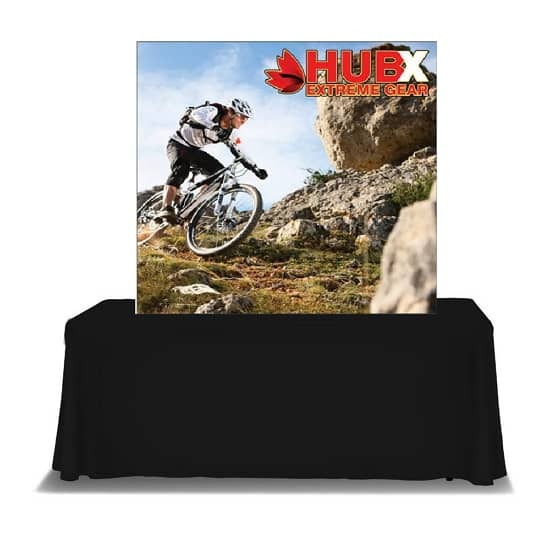 We love to recommend our tension fabric displays as back wall or Step & Repeat. 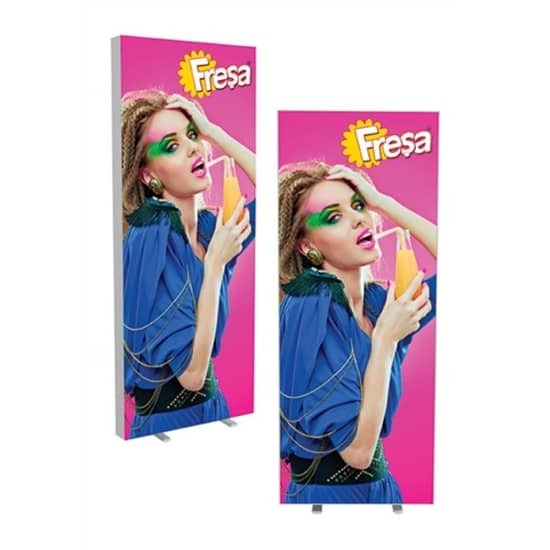 The vibrant, stretchy graphics superbly combine with light aluminum redefining PORTABILITY. 2-Day Production. 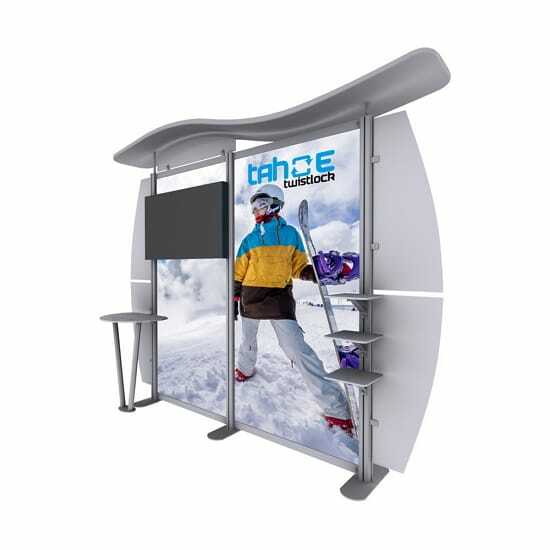 Pop Up Booths have been popular and reliable trade show display systems for many years among exhibitors looking at One-Case-fit-all for 8′, 10′ 20′ or tabletop solutions. 2-Day Production. 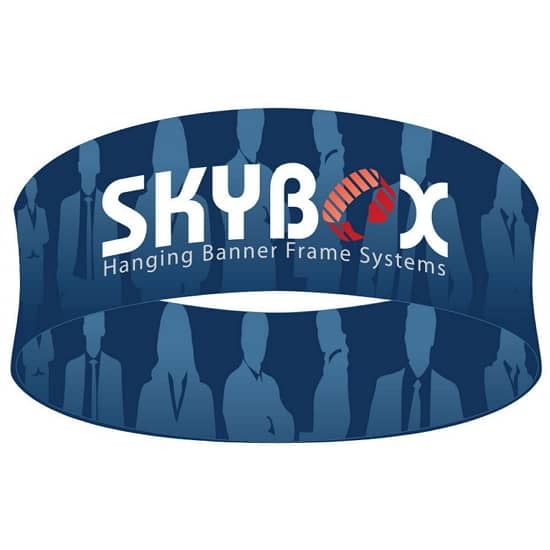 Looking to integrate a 42″ TV? 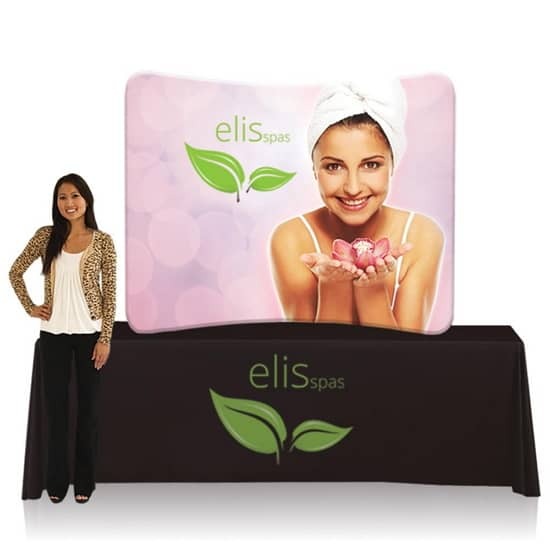 Use this stylish Trade Show display for your 10’x10′ or 10’x20′ exhibit spaces. 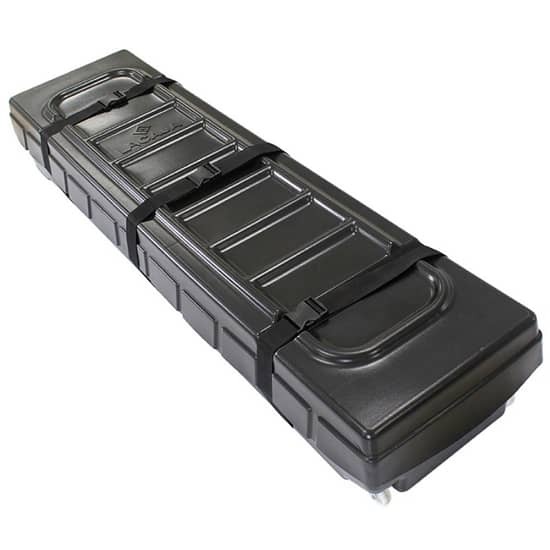 It comes with 3 acrylic shelves, a table top and a wheeled case. 2-Day Production. 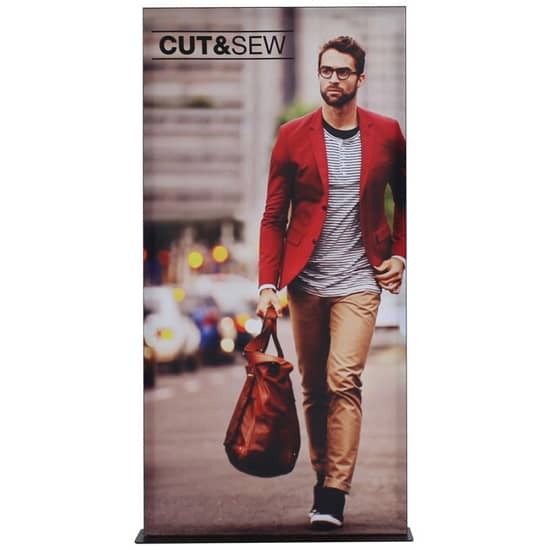 Great range of Retractable Banners from our Premium Silverstep spring retractable displays with printed fabric to our economy Rollup with vinyl print. 1 or 2-Day Production. 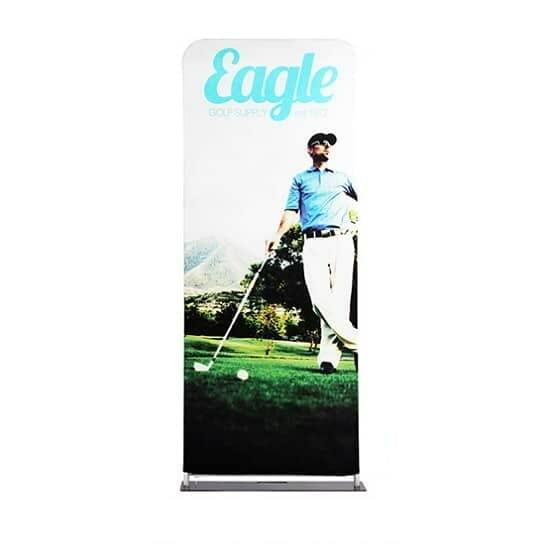 Our Banner Stands are portable, easy-to-setup and designed to fit within budget. 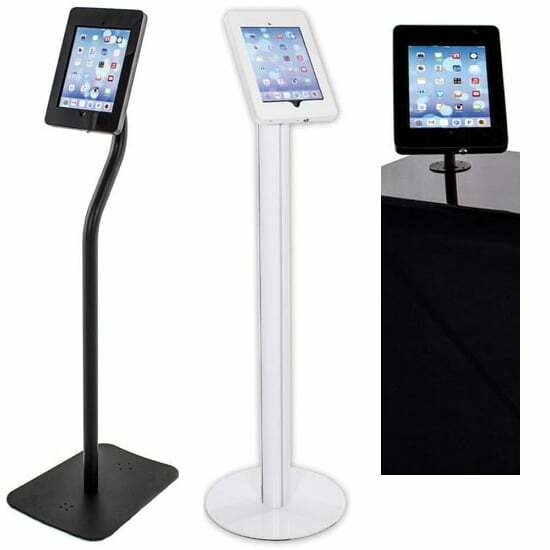 They come in various sizes and can be set up in less than 5 minutes. 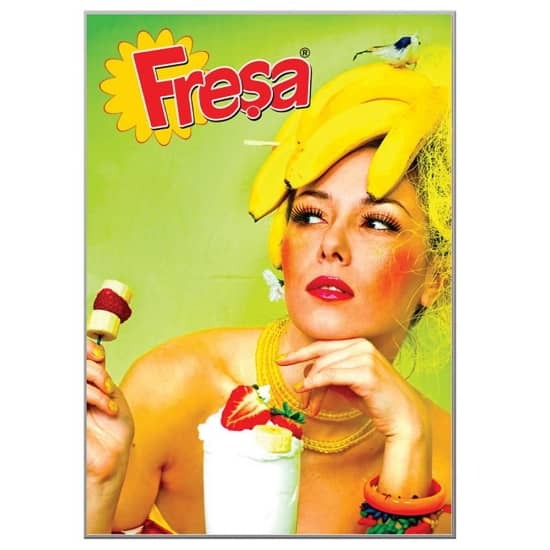 1 or 2-Day Production. 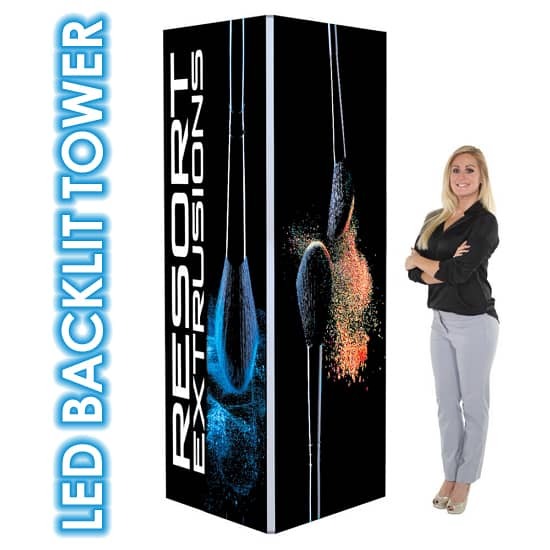 Illuminated LED Signs are easy to mount can be found everywhere whether as freestanding displays for your exhibit or as wall-mounted for retail stores. 3-Day Production. 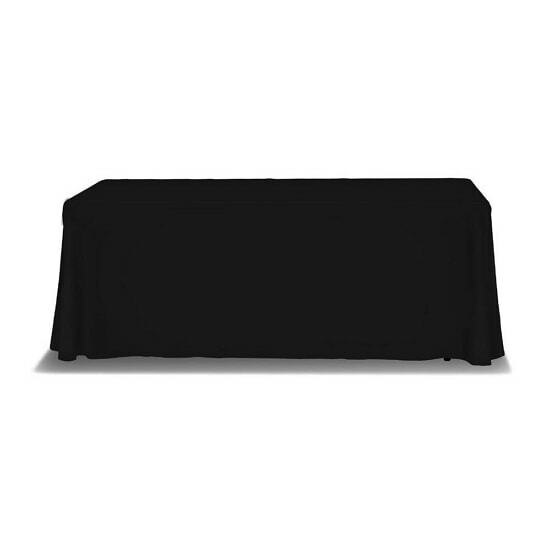 Doing a Tabletop event? 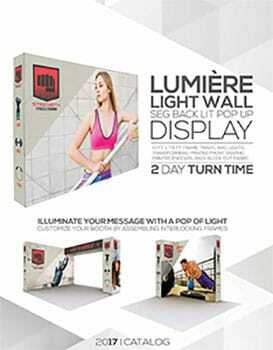 You need easy and quick way to display your message. 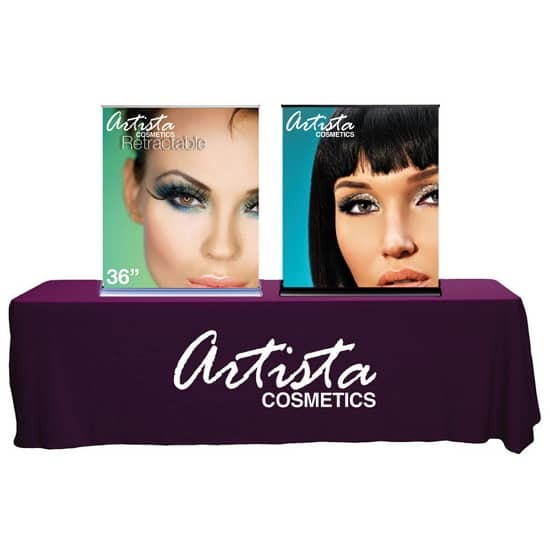 Choose from our large selection of Trade Show Table Top Displays. 2-Day Production. 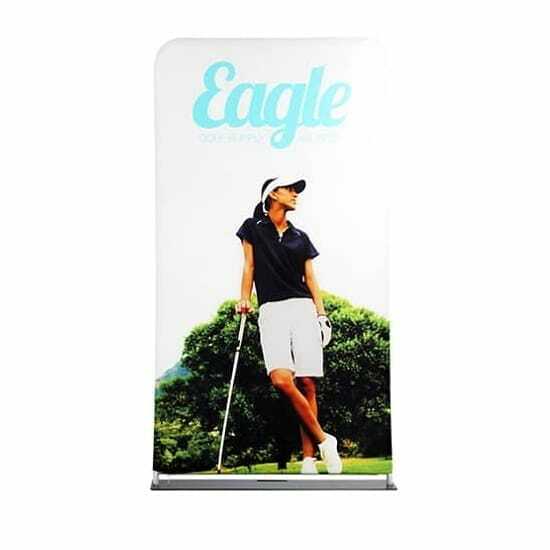 One of the fastest turnaround time in the industry for custom printed tent canopy and walls! 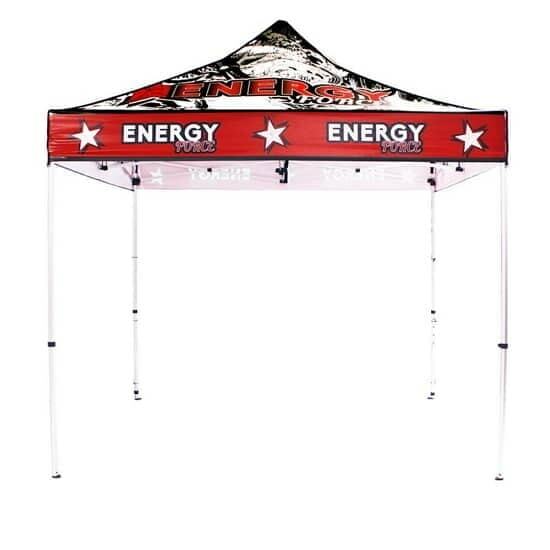 Our lightweight and durable Trade Show Tents are available in 5′, 10′, 15′ and 20′. 4-Day Production. 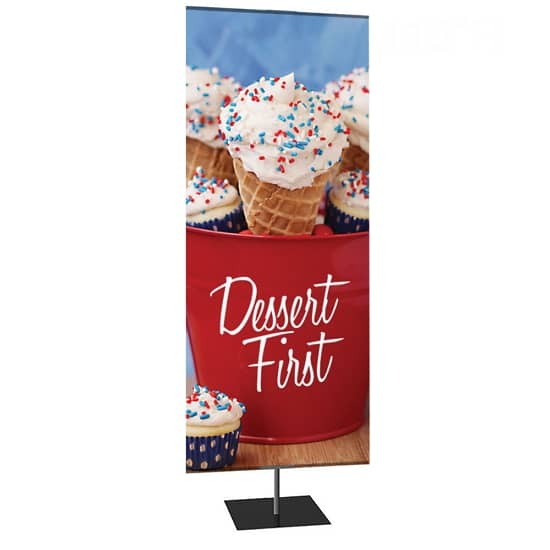 Outdoor Displays are portable outdoor flags and display systems that can easily increase your brand visibility at temporary outdoor events. 2-Day Production. 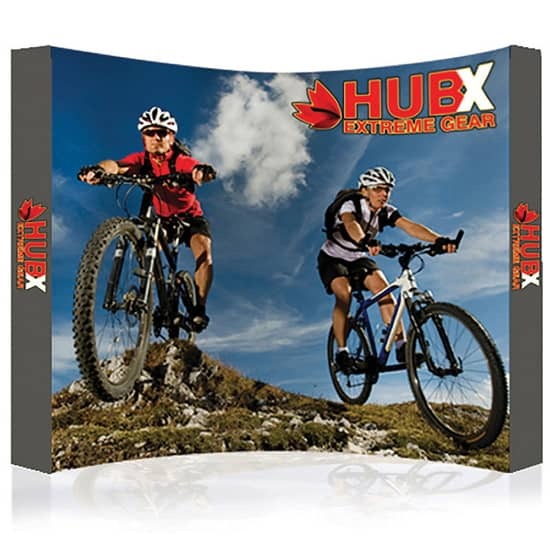 Our most popular Trade Show Table Covers are available at highly competitive prices, fast turn around time and high quality printing. 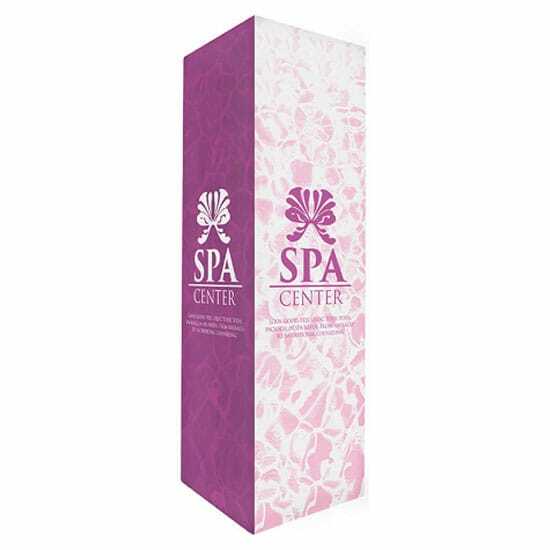 Select blank, 1 or 2 or full color printing. 2-Day Production. 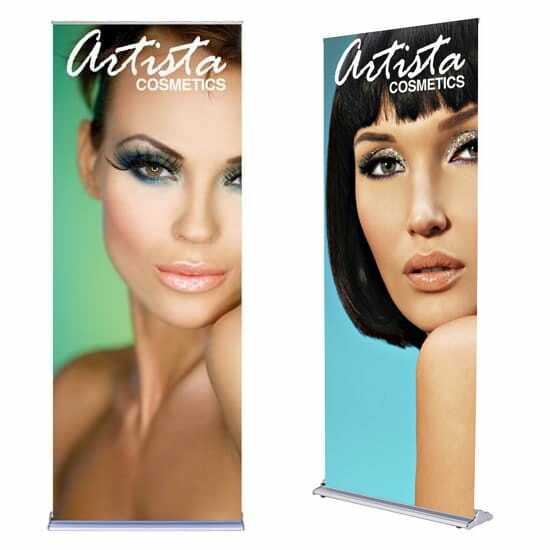 Ideal for trade show or high traffic areas, these Trade Show Hanging Banners will help you rise above your competition. Many 3D shapes thanks to stretchy fabric prints. 3-Day Production. 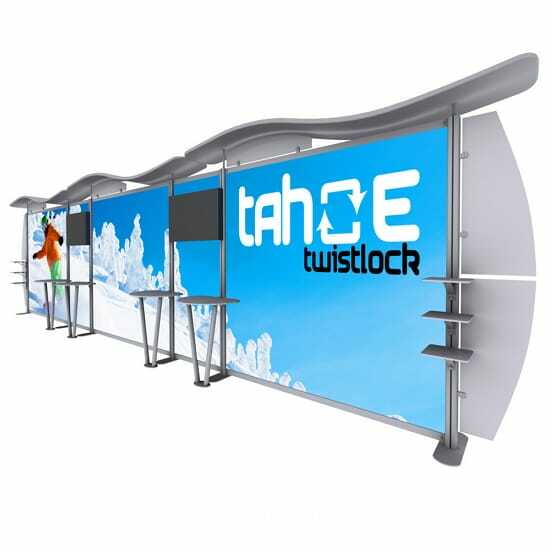 Trade Show Towers offer 360 degrees exposure using Round, Triangle, or Square frames w/ Silicone-Edge Graphics (SEG) or Tension Fabric. 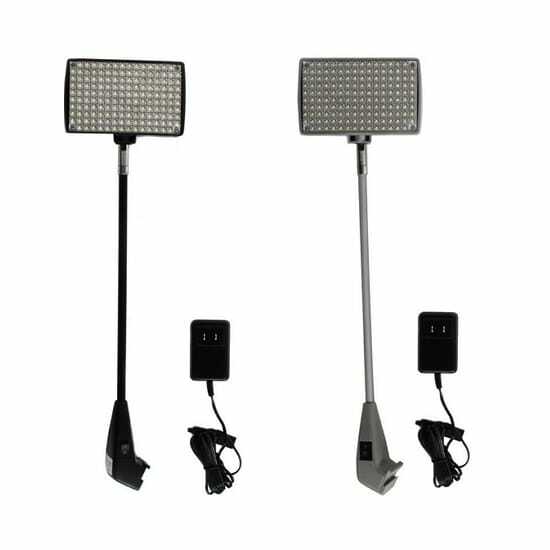 LED Backlit or Standard Kits available. 4-Day Production. 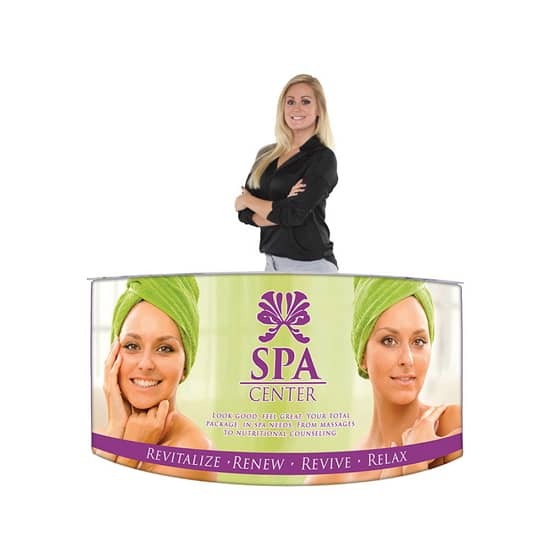 Praised for their portability and affordable prices, our Trade Show Counters easily ship and assemble. 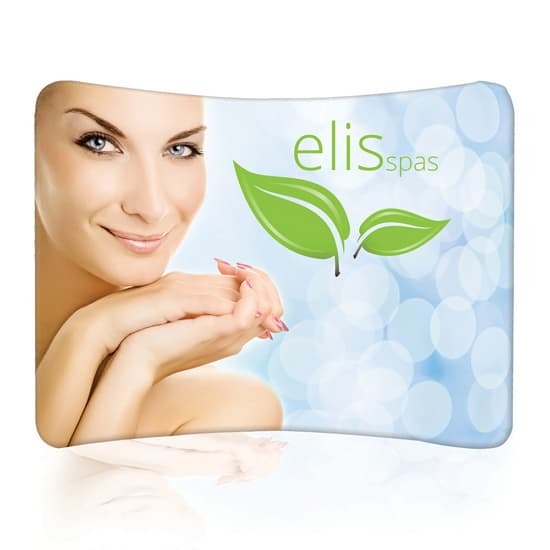 Curved counters link in various sizes and shapes. 2-Day Production. 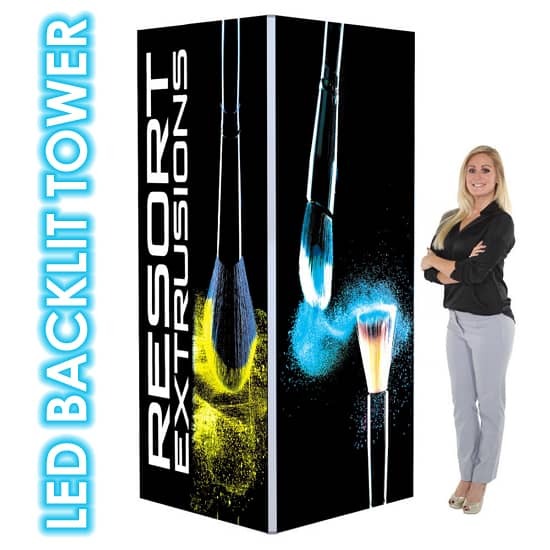 Brighten your display or exhibit with our selection of Trade Show Lighting. 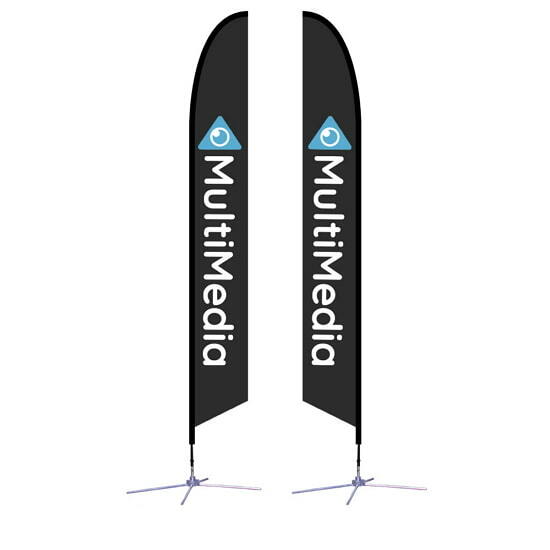 We’re happy to assist you show off your brand! Same Day Shipping from California or Pennsylvania. 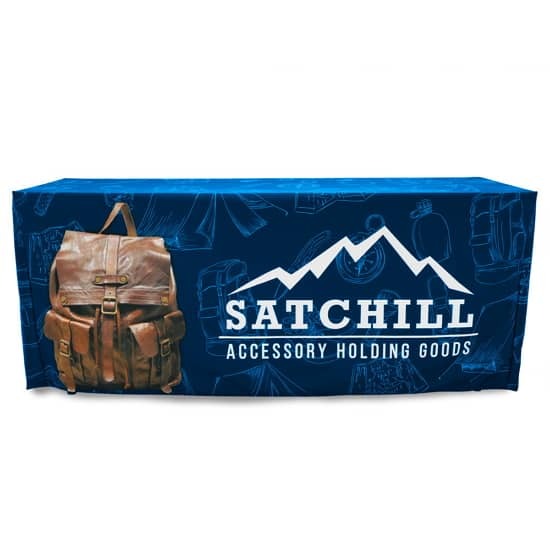 Our selection of Trade Show Shipping Cases and bags will help storing, transporting and protecting your displays. Same Day Shipping from California or Pennsylvania.